Scarborough RUFC’s Junior section provides rugby coaching and matches for girls and boys aged 12 to 18. 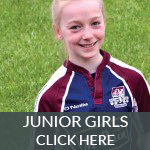 Junior rugby is for girls and boys aged between 12 and 18 years old. [Boys and girls cannot play contact rugby together from Under 13’s and above]. Training and matches takes place between 10.30am and 12:00pm on Sunday mornings and on designated weekday evenings between 6:15pm and 7:30pm. The weekday evening training varies for different age grades and details will be made available via the YDO. When matches are played, meet time, start and finish times may vary. Matches against other clubs are regularly scheduled and can be played both at home and away. Each season, coaches are appointed to specific age grades. Each age grade has a lead coach supported by a number of assistant coaches. In exceptional circumstances, and when a player reaches the age of 17, (18 for a front row forward) they may be considered able to play senior rugby. 1. All juniors must be registered with the club. We offer a come and try it policy whereby new players can participate in 2 or 3 sessions before we ask you to pay the annual subscription. Full details of Club membership, player’s packs and weekly subscriptions can be found in the Parent’s Handbook available from the Club. 2. Matches and Transport – For away matches, parents will be required to provide transport where possible for journeys of less than 40 miles. 3. Equipment/clothing requirements. All players should be equipped with boots with studs. For training sessions, players can wear shorts or trackpants, socks and a top which they don’t mind getting wet or muddy. Please provide a change of clothing for after the sessions and dress appropriately for the weather conditions. For matches, the Club supplies playing shirts and expects all players to wear Club shorts and socks. [These are included in the Annual Player’s Pack which each junior player can purchase at a discounted price when registering at the start of the season]. 4. Junior Rugby is full contact and gum shields are mandatory. Other safety equipment e.g. headguards etc. are optional. 5. Kit can be purchased from the club shop, which is open every Sunday morning (Purchases can also be made during the week by asking at Barons reception desk).